The New School of Furniture Making is run from our workshop at Sugarhouse Studios, just a minutes walk from Bermondsey tube station. 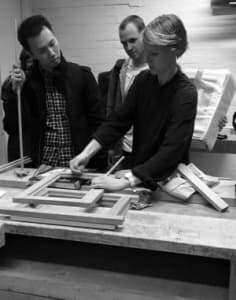 The tutors are all professional furniture makers who share the workshop and collaborate on commissions as well as teaching our courses. Set up initially to teach a few friends who were keen to learn woodworking skills, word spread and the school and projects evolved to accommodate a range of skill levels and interests. The atmosphere is fun and creative and groups are small to allow for most contact with the tutor. Courses are project based, and each student takes home a finished piece of furniture.